Agroecology is holistic study of agro-ecosystems, including all environmental and human elements that focuses on the form, dynamics and functions of their inter- and intra-relationships. It can also be defined as an ecological approach to agriculture that views agricultural areas as ecosystems and is concerned with the ecological impact of agricultural practices. Agroecology allows deeper scientific understanding of agriculture as it applies ecological principles to systems of food production taking into account relationships between different components of the agroecosystem including the human community. It teaches us to be in tune with nature while producing a diversity of healthy, nutritive and delicious foods, using sources of nature. Agroecology, in essence, is the philosophy of relishing all edibles that nature produces and, at the same time, of nurturing nature to allow it blossom with its biodiversities. Agroecology also delivers the social benefits associated with poverty reduction and community empowerment. At one hand where it reduces the possibility of environmental degradation, on other hand it is capable of delivering the environmental benefits through efficient resource use and reduced environmental impacts (both on – and off-farm). It also help protect biodiversity and enhances the resilience against the shocks associated with accelerating climate change. Agroecology is the emerging scientific paradigm based on the recognition of the ecological principals when applied to agricultural systems. Some of these ecological principles have been practiced in traditional agriculture and some of them have come from new findings in ecological disciplines, such as biodiversity and soil food web. Agroecology is time-tested and proven traditional way of farming that was evolved by farmers suiting to their diverse agro-climatic conditions. The experience of farmers around the world using agroecological methods has provided enough evidence of its economic, social and environmental benefits. Agroecological approaches have delivered increased food production and improved income for farmers, and enhanced food security and nutrition for the communities they feed. The input costs go down with time and farmers not only reduce the cost of cultivation but also increases the output. Agroeology is inevitable to provide balanced environments, sustained yields, biologically mediated soil fertility and natural pest regulation through the design of diversified Agro-ecosystem and the use of low-input technologies. Principles of agroecology revolve round an agroecosystem – community of plants, animals and microorganisms, the three functional biotic components, interacting with each other and among themselves and with the physico-chemical environment modified by farmers to produce foods, fodder, fiber, fuel, and other useful products. Agroecology provides us an opportunity to make a holistic understanding of the agroecosystems which we design and manage for food production. Since ages farmers had been protecting, conserving and augmenting natural resources, such as forests, grasslands, biodiversity in forests / agro-biodiversity, livestock, soil, water resources, and overall farming cultures through applying the principles of agroecology. Agroforestry Systems, Mixed farming /Polycultures. Cover Crop, Crop Rotations and Livestock. Keeping in view the challenges like climate change mitigation and adaptation, as well as future food security; empowering the family farmers in agroecological approach could play a crucial role, as agroecology offers the prospect of sustainable food production to meet the needs of a still growing global population. Agroecolgical farming also helps reducing the GHG emissions from the agricultural sector and also building resilience to already unavoidable climate change, protecting biodiversity, and sustaining communities and rural livelihoods. 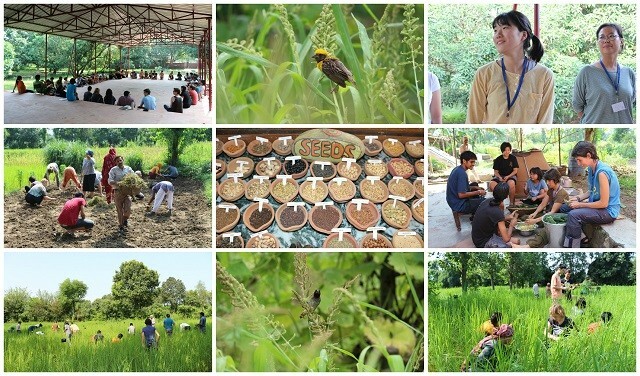 The promotion of biodiversity-based agroecology for economic security and the mitigation of climate change, together with seed and food sovereignty are central to Navdanya’s vision of an Earth Democracy. Navdanya’s learning centre Earth University (Bija Vidyapeeth) offers training in agroecological farming and biodiversity conservation to farmers across India as well as annual month-long courses for citizens’ organizations from across the world on the principles and practice of diversity and sustainable ecological farming combined with hands on and practical experience. Farmers and students learn how agroecology not only increases farmers’ incomes, but also increases nutrition and health while rejuvenating soil, water and biodiversity and at the same time mitigate climate change and enhance resilience. 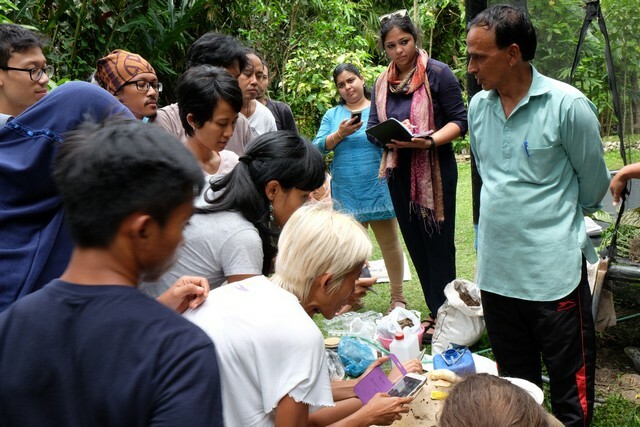 A Global Capacity Building Workshop on Biodiversity, Agroecology and Organic Food Systems is being held every year – since 2012 – at the Navdanya Biodiversity Conservation farm, for citizens’ organizations and movements from across the world, with eminent scientists and environmentalists, an opportunity to learn from nature and farmers as teachers, as well as from the cutting edge ecological research combined with practical experience and participation in community activities. The Navdanya Biodiversity Conservation Farm is where the actual practice of Navdanya’s methods of agroecology and organic farming takes place. The farm functions as a living system from which farmers, school groups, course participants and interns can learn. Navdanya’s practical experience and training programs span across all production needs of farmers – seeds, soil fertility, pest control, and water conservation. Practice and programs cover the entire food chain-from farmers’ fields to the tables and kitchens of consumers. Navdanya has been working with small farmers and communities to work towards a transition to an agroecological food system. Navdanya’s farmers’ training takes places both at Navdanya’s learning centre and through field trips across India and is based on experience, research and knowledge exchange developed through the years and in continuous evolution. 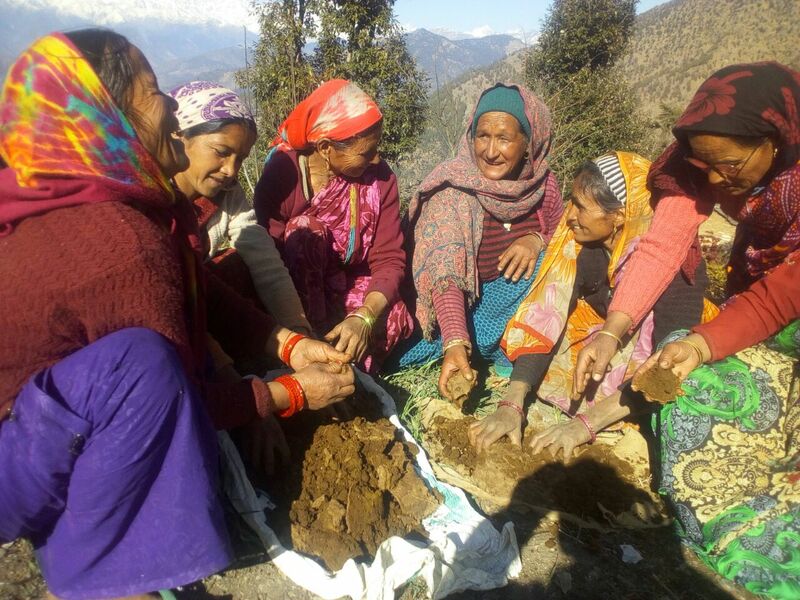 Navdanya has been actively collaborating with communities, schools, government officials, representatives of national as well as international NGOs, Voluntary Organizations with programs on transitioning towards biodiversity conservation and organic farming. Navdanya is helping the Government of Bhutan in their initiative of converting the entire country to organic by providing training to farmers and agriculture officers, as well as helping in documenting the transition from a chemical to an organic system. Along the same lines, Navdanya is working in Ladakh and Sikkim, which has already taken major steps to promote organic agriculture. 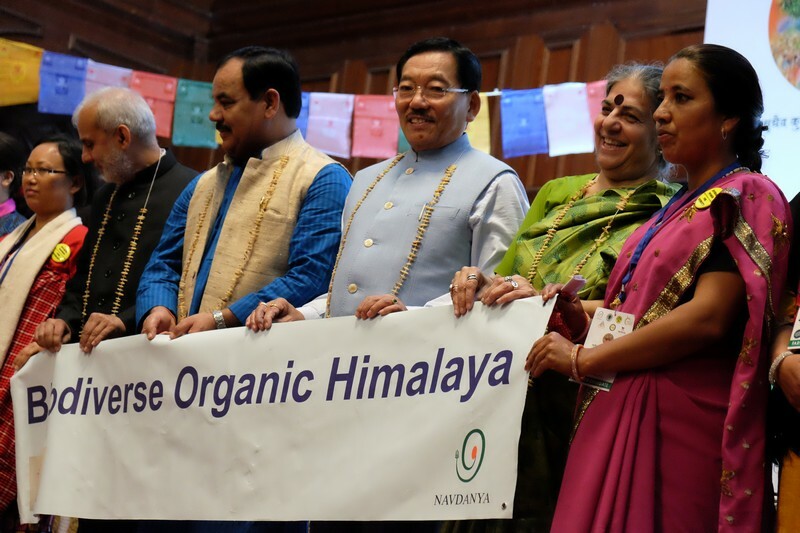 Navdanya has also trained secretaries and extension officers of the Tibetan government in exile and now their settlements across the country are in conversion to organic. In April 2018 Navdanya joined the 2nd International Symposium on Agroecology, took place in Rome at FAO Headquarters. Navdanya presented its studies, and the outcomes of programs and actions on the ground carried out in the last 30 year. The symposium represented a significant opportunity for CSOs to present ideas and projects, share knowledge and strengthen alliances. From 2nd to 8th October 2018 a series of events on Biodiversity were held in Doon Valley. Amidst the heated context that India finds itself in with regard to the farmers’ crisis, the recent farmers’ protests, as well as the global attack of corporations hijacking our food supply, diversity, freedom, democracy and peace, it becomes an act of resistance to celebrate the gifts that Mother Earth provides. Activities included the International Biodiversity Congress was held at the Forest Research Institute in Dehradun. A 3 day congress focused on Biodiversity, from the scientific level to children, who joined eminent scientists from around the world. The theme of the congress was: ‘towards an ecological civilization’, Vasudhaiva Kutumbakam, the Earth Family. Navdanya joined forces with various national and international partners to launch the movement for a Biodiverse Organic Himalaya, partnering with Pawan Kumar Chamling, the chief minister of Sikkim, who converted 100% of his State’s agricultural production to organic farming, to which Navdanya, has actively contributed. On 15th October 2015, he was awarded the Future Policy Award 2018 by the World Future Council, the Food and Agriculture Organisation of the UN (FAO) and IFOAM Organics International in Rome during the World Food Day celebrations on 15th October 2018, which included a press conference, ogranised by Navdanya International, at the Italian Chamber of Deputies Press Room with Italian Parliamentarians.